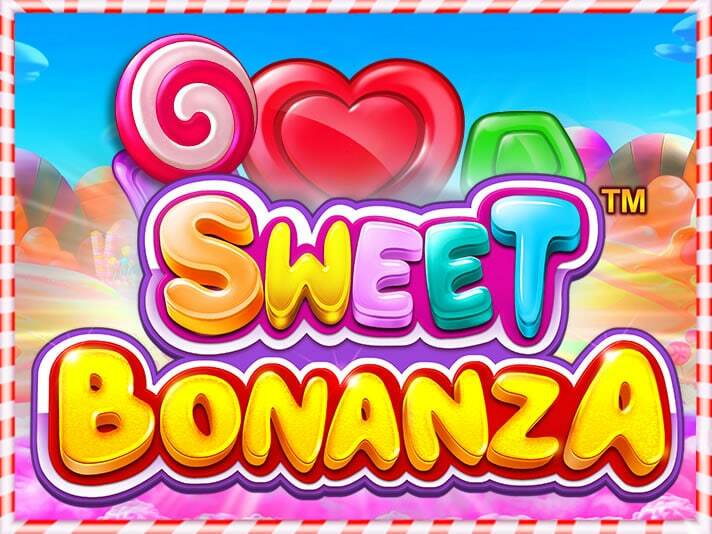 Enjoy some tasty, sugary treats in Sweet Bonanza, a 6 reel, All Ways slot from Pragmatic Play. The action in this colourful game takes place using a tumbling reels game engine. The highlight is the bonus round that awards 10 free spins where multipliers can boost payouts by up to 100x. Play on all devices from between 20p and £125 per spin. The first decision you’ll have to make on firing up Sweet Bonanza is whether to play at stakes of 20 or 25 coins per spin. At 20 coins (from 20p to £100 per spin), you’ll have the option to buy the feature for 100 times your stake. At 25 coins (from 25p to £125 per spin) you won’t have the chance to buy the feature. Extra scatter symbols are added though, doubling your chances of triggering the bonus round naturally. This is known as the Ante Bet feature. Anyway, Sweet Bonanza is an explosion of colour. A strange world made up entirely of candies and cakes forms the backdrop to the action. On the reels you’ll see an assortment of fruit and sweetie symbols. They include bananas, grapes, melons, plums and apples. More rewarding are the green, blue and purple sweets. The best payer is the red heart. Land 8 or 9 of these anywhere on the reels for a payout of 8 times your stake. 10 or 11 of them award 20 times your stake. Land 12 or more for a payout of 40 times your stake. After a winning combination hits, the Tumble feature kicks in and a tumble takes place. The winning symbols are removed from play and new ones drop in and replace them. These tumbles continue as long as a new winning combination is created. That Free Spins feature is activated by landing 4, 5 or 6 of the lollipop scatter on the same spin – you’ll then receive 2, 4 or 80 times your stake as well as 10 free spins. Look out here for the candy bomb symbols. These come with a multiplier which can boost your tumbling wins by between 2x and 100x. Land 3 scatters on the same free spin and you’ll get another 5 free spins added to your total. Pragmatic Play have really gone overboard with the design here which is really in your face. The gameplay is pretty straightforward though. The tumbling reels keep the action moving nicely and the multipliers can help in Free Spins feature. The variance here is medium to high with potential wins of 21,100 times your stake in the feature with the potential 100x multiplier. With its psychedelic visuals, Sweet Bonanza won’t be to all tastes. It’s not something we’ll be coming back to again and again but it could give you a quick sugar rush if you enjoy this colourful theme. If you have a sweet tooth, Baker’s Treat from Play ‘N Go is recommended and is a more conventional slot.